Click on the start button in the video player below to start the USS Oriskany 1666 Westpac air operations video. If it doesn't show up it may be because your computer restricts activeX content. If it does restrict such content you will see a yellow bar across the top of the screen saying something like "Certain information has been restricted to protect your computer. Click on the bar to see options." If this happens, just click on the bar and click "allow activeX". Thanks to Gene Lewis and Dr. Killinger for the video. Gene has an excellent web site on the Oriskany that he keeps expanding. The link to his site is toward the bottom of this page or just click on the link here http://www.ussoriskany.us/. The U.S.S. Oriskany website published by Gene Lewis offers many of the U.S.S. Oriskany Cruise Books for sale in either CD form or direct download to your computer. At the check-out page you can get 10% off by entering the coupon code "cdr Jack" without the quotation marks. I have no personal interest in the sale of cruise books on this this web site or anywhere else and offer the above coupon code as a courtesy to readers. As hundreds of veterans looked on solemnly, Navy divers blew holes in a retired aircraft carrier, the "Mighty O", and sent the 888-foot USS Oriskany to the bottom of the sea Wednesday, forming the world's largest deliberately created artificial reef. The "Mighty O" went down in 212 feet of water, about 24 miles off Pensacola Beach. The Oriskany, commissioned in 1950 and named after an American Revolutionary War battle, saw duty during the Korean War and was home to John McCain when the Navy pilot and future senator served in Vietnam. McCain was shot down over Hanoi in 1967 after taking off from the Oriskany and was held as a prisoner of war for five years. It was also among the ships used by President Kennedy in a show of force during the 1962 Cuban missile crisis. It was decommissioned in 1976. The Oriskany became the first vessel sunk under a new Navy program to dispose of old warships by turning them into reefs that can attract fish and other marine life. USS Oriskany CVA-34 departed San Diego, California, May 26, 1966, in route for Pearl Harbor. In Hawaii, the Mighty "O" underwent her operational readiness Inspection to determine her readiness for overseas deployment. Steaming from Pearl Harbor on June 6, Oriskany proceeded to the U.S. Naval Air Station, Yokosuka, Japan, for a brief visit. Arriving in Yokosuka on June 14, she remained in this Japanese port until June 21, 1966, once again observing the Ship’s tradition of hosting children from the Oriskany Home, an orphanage under the care of Catholic Salesian nuns in Kusanagi, Japan. Oriskany men donated the funds with which the home was built in 1952 and still continued their support. Leaving Japan, the ship steamed southward to the fleet support base at Subic Bay, Philippine Islands where two days were spent before Oriskany joined other Seventh Fleet units making up Task Force 77, in the South China Sea. Oriskany’s first operational period was spent on "Dixie Station" from June 30 to July 7, then moving up to "Yankee Station", from July 8 through July 28. This first sea period proved indicative of the vigorous pace Oriskany would maintain throughout her deployment, with air operations beginning before dawn and continuing far into the night. On July 13 and 14, Oriskany was honored by a visit on board by the Secretary of the Navy, the Honorable Paul H. Nitze. On July 16 and 17, Vice Chief of Naval Operations, Admiral Horatio M. Rivero, paid Oriskany a visit. After 34 days at sea, Subic Bay was a welcomed site, for a little rest and recreation, but arriving on July 30, Oriskany departed again on August 4 and was back on Yankee Station, in the Gulf of Tonkin on August 7. Under the adverse conditions of extreme tropical heat, shortages of fresh water and other comfort commodities, Oriskany accomplished her assigned tasks without missing a single day’s combat mission. Work days of 15 hours or more were normal routine, seven full days a week. The famed radio and television personality, Author Godfrey was a guest on board Oriskany, August 11 to the 14, during which visit he inaugurated the ship’s new closed circuit television station, KRIS-TV. Not content with flying ordnance off the ship at record rate, Oriskany men set a new underway ordnance replenishment record with the ammunition ship, USS Mt. Katmai AE-16 at the unbelievable rate of 437.5 tons per hour. Underway replenishment is the tricky operation of receiving ordnance, food, fuel and other supplies from support ships, while underway at sea. From the 9th until the 14th of September, after 30 days "on the line", Oriskany was back in Subic Bay once again for another brief respite. 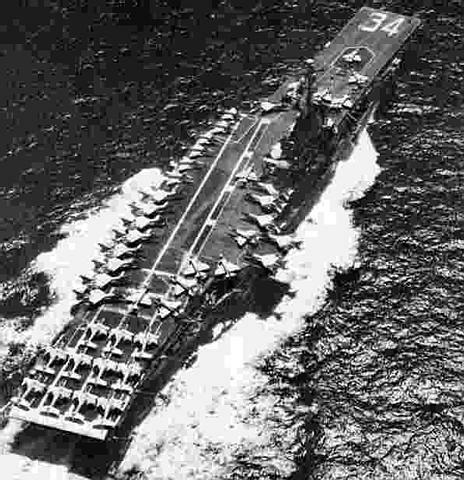 Departing Subic, September 15, on her way to Hong Kong, Oriskany participated in "Operation Crossdecks" with HMS Victorious, in which planes from Oriskany flew over and landed on board Victorious, with her planes flying to the Oriskany. Oriskany performed a daring rescue operation, via her helicopters, on September 16, when she moved the 44-man crew of the SS August Moon, a merchant ship of British registry, aground on Pratas Reef, 175 miles southeast of Hong Kong. A near tragedy resulted, when one of Oriskany’s helicopters was engulfed by a gigantic wave and crashed into the water, but all three crewmembers were picked up by other helos and returned to safety. Oriskany put into the port of Hong Kong, on September 17, spending from the 17th until the 22nd in this exotic British Crown Colony. On September 24, the Mighty "O" was back again on Yankee Station, carrying out her tight and exhausting operational schedule. Oriskany set two records, on October 1st, with the 116,000th fixed wing landing on board and her 6,000th helicopter landing. Sunday, October 9, saw Richard M. Bellinger, Commanding Officer of Fighter Squadron 162 "Hunters" , "Day of Retribution" downing of a North Vietnamese Mig 21, evening the score, after having been shot down by a Mig three months before. Oriskany was honored by the visit of Secretary of Defense, Robert S. McNamara, Assistant Secretary of Defense for Public Affairs, Author Sylvester, Chairman of the Joint Chiefs of Staff General Earle G Wheeler, Commander in Chief Pacific Adm U.S.G Sharp, and other high ranking military leaders, on October 12th and 13th. During his visit on Board, Mr. McNamara presented CDR Bellinger with Silver Star medal for his Mig kill. Movie and television personality John Gavin paid a visit to Oriskany, on October 21 and was interviewed over the ship’s television station, KRIS-TV during his tour of the carrier. On the morning of October 26, Oriskany’s combat operations in the Gulf of Tonkin came to a sudden and tragic termination when her morning launch was halted by the disastrous fire which erupted on board this proud combat veteran. Erupting in the vicinity of the starboard aircraft flare locker, in hangar bay one, the fire spread rapidly forward, extending over five decks, trapping many officers in their staterooms. Before the fire was brought under control, some three hours later, 44 shipmates, 36 officers and 8 enlisted men, had lost their lives. Many of this number were veteran combat pilots, who hundreds of times had survived the flak and missiles over North Vietnam. Click here to go to Gene Lewis' Oriskiny web site where you can view the original Life magazine story on the fire aboard the Oriskany in October 1966 as well as a lot of other memorabilia relative to the ship. It's an outstanding web site. Click here to go to the account of the fire in the Bureau of Naval Personnel magazine All Hands. Click here to read an account of the fire in Time Magazine. "My Memories of that Day"
"We had just gone to flight quarters on the morning of October 26, 1966. It was a beautiful sunny day and the ship had turned into the wind to begin the morning launch of aircraft. We had already launched one or two A4 aircraft before the fire broke out. We were also running side by side with an ammunition ship, I think it was the USS Katmire. Not sure on the name. We were taking on ammunition, side winders, gravity bombs and flares. The hanger deck was lined with gravity bombs that had been high-lined over from the other ship. I remember the first sign of fire, to the busy flight deck was the smoke bellowing up from the starboard side, just forward of the island. The fire alarm was called over the ships communication system. The ammunition ship did an emergency break away. At the time the ship was still running into the wind and the smoke had engulfed the flight deck. It was almost impossible for a time to even see any distance or breathe, because there was so much smoke. The ship finally tuned so that the smoke was blowing away from the starboard side of the ship. For a while this really hampered the fire fighters and rescue workers in there attempts to rescue and put out the fire. As you know from your Navy fire fighting training, that a magnesium fire cannot be put out with water, it virtually has to be smothered. The men who were assigned to the flight deck operations went immediately to their fire stations, manning fire hoses on the flight deck. Pumping water over the starboard side onto the heated area. I remember donning the OBA (Oxygen breathing apparatus) and being tied to other sailors by a lanyard and being sent into the lower deck spaces from the port catwalk to rescue sailors that were trapped or lost in the passage ways. The heat was intense. It felt like we had entered into a 350 degree oven. It was so hot, even after walking only 10 or 20 feet into the passage ways, you could feel the intense heat coming from the fire. There were no lights, and lot of smoke, you could hardly see your way, only feel. On the flight deck, at elevator number 1, forward, between the catapults, the rubber caulking around the elevator and the pad eyes was bubbling from the intense heat below. This area was real close to the core of the fire, I would say almost right below. Just starboard of the elevator 1 and a little aft is the location of the flare lockers. I believe there were three flare lockers. I remember the un-identifiable, charred remains of sailors being brought up to the flight deck and being laid out next to the island of the ship. A space just inside of the island, were the yellow and blue shirt flight deck crew used for their coffee locker, was set up as a place for the dead to be placed into body bags. We fought the fire for hours, we pushed A4's laden with bombs over the side from the hanger deck, elevator 2, that had been readied for launch for that mornings flight quarters. We rolled the gravity bombs over the side that had been laid out on the hangar deck, to get them out and away from the intense heat of the fire. A lot was going on everywhere. No time for anyone to give commands, it was a time when every man had to think for them selves and act on whatever they could do to help save lives and extinguish the fire. After the fire was brought under control, the Oriskany steamed slowly back into Subic Bay, Philippines. The ship was heavily list by taking on so much water to cool and extinguish the fire. Some were afraid that it may even sink. The thought had definitely crossed my mind and others as well. I hope that this will be of some use to you. As you know I can't verify any of this information, only recant my memories. I hope that you and others will enjoy reading this. Thanks a lot for giving me the opportunity to write my memories down and let other people know how it was from the view point of a 19 year old American sailor." Having extended her own time "on the line" a number of times previously to "pinch hit" for other carriers suffering unfortunate engineering casualties now the majestic pace setter herself was forced to withdraw, due to her extensive fire damage. Oriskany steamed solemnly into Subic Bay, early on the morning of October 28 with her colors at half mast, in honor of her dead, unloaded the flag draped bodies of her departed shipmates to fly them home for burial. Upon the request of his family, one body was retained on board for burial at sea. After a few major repairs at Subic Bay, Oriskany departed on the morning of November 3, for her return to the United States and a yard period to repair her fire damage and return her to her former "combat readiness" once again. On November 6, 125 miles east northeast of Iwo Jimo, memorial services for Oriskany’s 44 fire victims were held and the body of LCDR Omar R. Ford, of Chula Vista, California, a native of Lincoln, Nebraska, was committed to the deep. Oriskany was deployed just short of six months, spending 142 days of this time at sea, steaming over 75,000 miles and dropping 6,272 tons of ordnance on communist targets in North Vietnam. 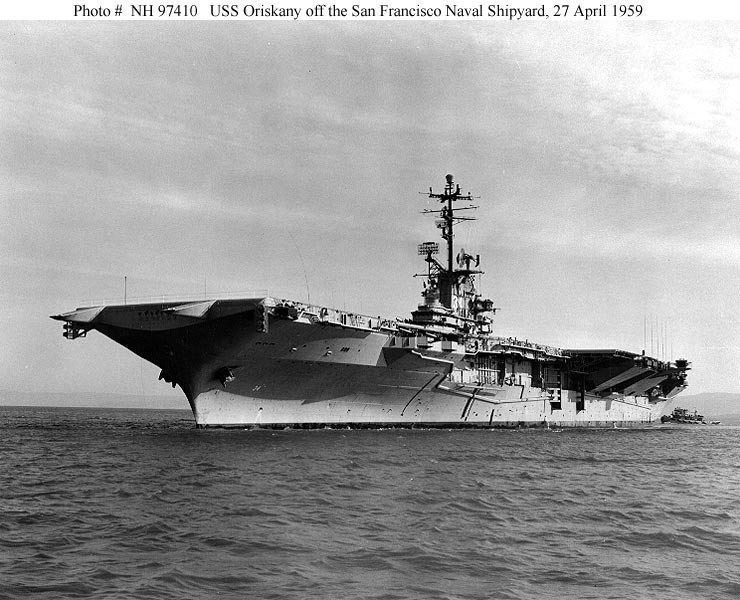 Click here to go to a web site that gives information about the USS Oriskany, including free access to all of the Oriskany Cruise Books. Lou Jackson served on the USS Oriskany from 1963 to 1967 as a Yellow Shirt Fly-1, serving three tours off Vietnam. His son, Scott Jackson furnished these pictures of an A-1 Skyraider model he put together.